What are over half a dozen functions that your bones perform? What is the location and composition of bone marrow? How many blood cells does human marrow produce each day? Does the marrow also produce bone? What makes the marrow look red or yellow? Composed of a complex external and internal structure, a bone is a rigid organ that performs a lot of important functions in your body. For example, the bones give shape and support to your body, protect various organs, store minerals, enable mobility, and produce blood cells. What is Bone Marrow and What Is Its Function? 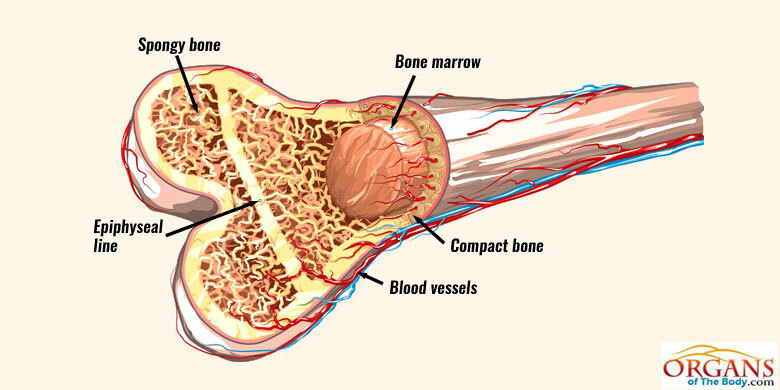 The marrow in your bones serves as the primary site to produce red blood cells (RBCs) and white blood cells (WBCs). 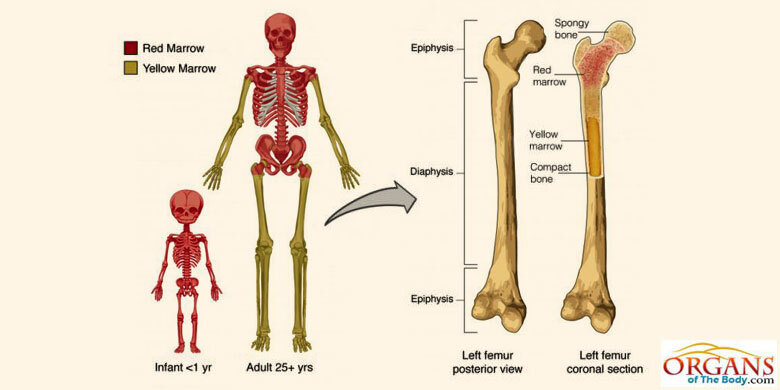 The bone marrow structure can be described as a mixture of cellular and noncellular components or connective tissue. In addition to its involvement in hematopoiesis (blood cell production), bone marrow also helps store fat. While the red marrow produces RBCs, WBCs, and platelets, the yellow marrow does the job of storing fats. Stored in the adipocytes, the fat can serve as the source of energy at the time of need. Production of bone and muscle cells are some other functions of the marrow. The mesenchymal stem cells, present in it, can develop into cartilage, bone or muscle cells. The marrow is found in the spongy portions of the bones. It is primarily located in the ribs, the sternum, the vertebrae, and the pelvic bones. It may appear as red or yellow depending on the predominance of fat cells versus hematopoietic cells. The prevalence of hematopoietic cells renders red hue to this semi-solid tissue (as in a newborn baby). On the other hand, it looks yellow due to the presence of a much higher number of fat cells (as in adults). In adults, the medullar (central) cavity of the long bones houses the yellow marrow while the red marrow is present in the vertebrae, sternum, ribs, skull, and the ends of long bones in the legs and arms. Approximately 500 billion blood cells are produced by the bone marrow per day! The bones of an adult contain around 2.6 kg of the marrow, contributing about 4 percent of the total body mass. Did you know a newborn baby’s marrow looks red which progressively turns yellow with age? 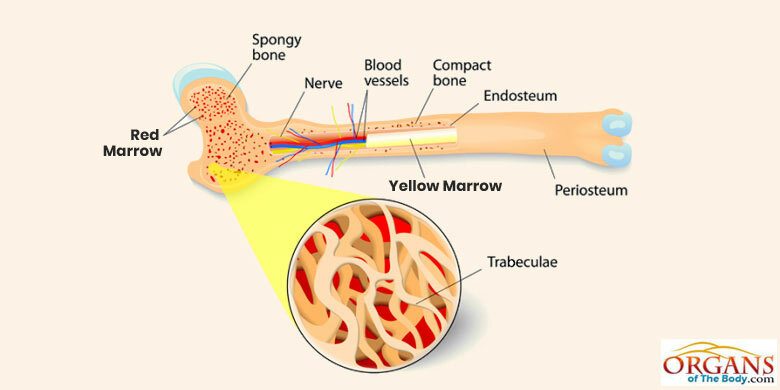 The yellow colour of the marrow represents a much higher concentration of fat cells. Composed of the haematopoietic stem cells, the red marrow produces the red blood cells, white blood cells and platelets. Mesenchymal stem cells of the marrow are involved in the production of bone, cartilage, and adipocytes (fat cells). Severe diseases of the marrow, such as certain cancers, can be treated by transplants. In the US alone, about ten thousand people require bone marrow transplants each year. Leukemia (over-production of WBCs) causes more deaths among children than any other cancer each year. If you donate bone marrow, it will replace itself in less than two months (4 to 6 weeks). DNA is used to identify the right match for the marrow donation.